A radar and gravity survey of the ice-filled caldera at Volcán Sollipulli, Chile, indicates that the intra-caldera ice has a thickness of up to 650 m in its central part and that the caldera harbours a minimum of 6 km3 of ice. Reconnaissance geological observations show that the volcano has erupted compositions ranging from olivine basalt to dacite and have identified five distinct volcanic units in the caldera walls. Pre- or syn-caldera collapse deposits (the Sharkfin pyroclastic unit) comprise a sequence which evolved from subglacial to subaerial facies. Post-caldera collapse products, which crop out along 17 of the 20 km length of the caldera wall, were erupted almost exclusively along the caldera margins in the presence of a large body of intra-caldera ice. The Alpehué crater, formed by an explosive eruption between 2960 and 2780 a. BP, in the southwest part of the caldera is shown to post date formation of the caldera. 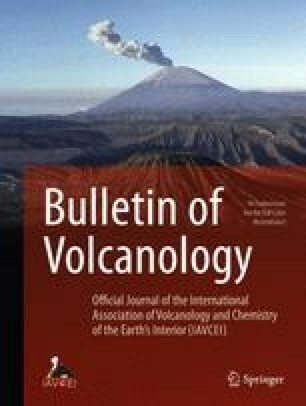 Sollipulli lacks voluminous silicic pyroclastic rocks associated with caldera formation and the collapse structure does not appear to be a consequence of a large-magnitude explosive eruption. Instead, lateral magma movement at depth resulting in emptying of the magma chamber may have generated the caldera. The radar and gravity data show that the central part of the caldera floor is flat but, within a few hundred metres of the caldera walls, the floor has a stepped topography with relatively low-density rock bodies beneath the ice in this region. This, coupled with the fact that most of the post-caldera eruptions have taken place along the caldera walls, implies that the caldera has been substantially modified by subglacial marginal eruptions. Sollipulli caldera has evolved from a collapse to a constructional feature with intra-caldera ice playing a major role. The post-caldera eruptions have resulted in an increase in height of the walls and concomitant deepening of the caldera with time.